To celebrate Chinese New Year on Friday 31st January 2014 (the year of the Wooden Horse), Illamasqua counters at Myer have launched an exclusive limited edition nail varnish called 'Destiny'. Such a beautiful name, isn't it? Single coat on the two nails on the left and two coats on the two nails on the right. Destiny features fine hexagonal and spotted gold glitter particles in a sea of bottle green nail varnish as the base. I don't have any shades of emerald green in my nail polish collection, so Destiny sure is a stand out amongst my other nail polish bottles. Although the formula of Destiny is somewhat viscous, I found that it was a breeze to achieve an opaque finish with just one coat. The glitters appear moderately dispersed leaving a gorgeous jelly base finish. The sparkling finish is pretty much like the surface of exquisite wine glasses! I absolutely love the fact that the overall finish of Destiny appears exactly the same as the shade in the bottle! Illamasqua Destiny Nail Varnish (A$22.50/15ml) is available exclusively at Myer from 14th January 2014. What's going to be on your nails during Chinese New Year? I've always overlooked green shades of nail varnish until I met the shade Destiny. 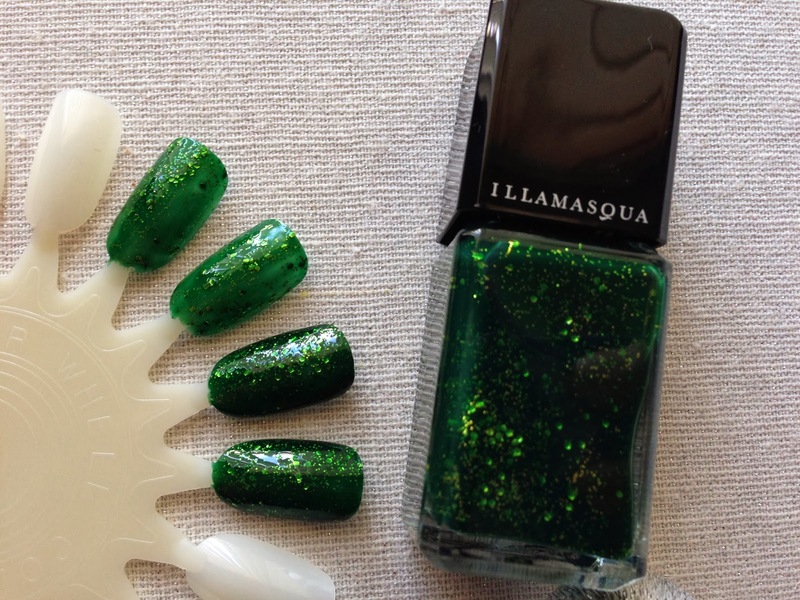 Good thing Illamasqua at Myer launched a green shade with sparkles for their exclusive Lunar New Year nail varnish!